These Civil War period pistol sets are the perfect finishing touch to almost any Civil War era costume. They are available in both Union and Confederate styles. 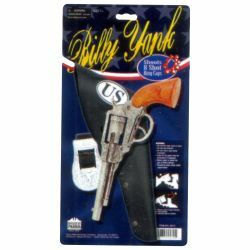 The Union set features a holster with “US” and the Confederate set features a holster with “CS”. The Civil War period pistol sets are colored as pictured and includes the pistol, a holster, and a belt. These guns fire the 8 shot ring caps. Use the drop-down box below to select a style.